Quaker Records: Quaker records are extensive, well indexed and centrally maintained in two location in Ireland. Most are at the Dublin Friends Historical Library. Ulster Province Meeting Records and those of the Monthly Meetings in Ulster are retained by the Society's Ulster Archives Committee at Lisburn. The National Abstract Registers, including those of Ulster, are held at DFHL. 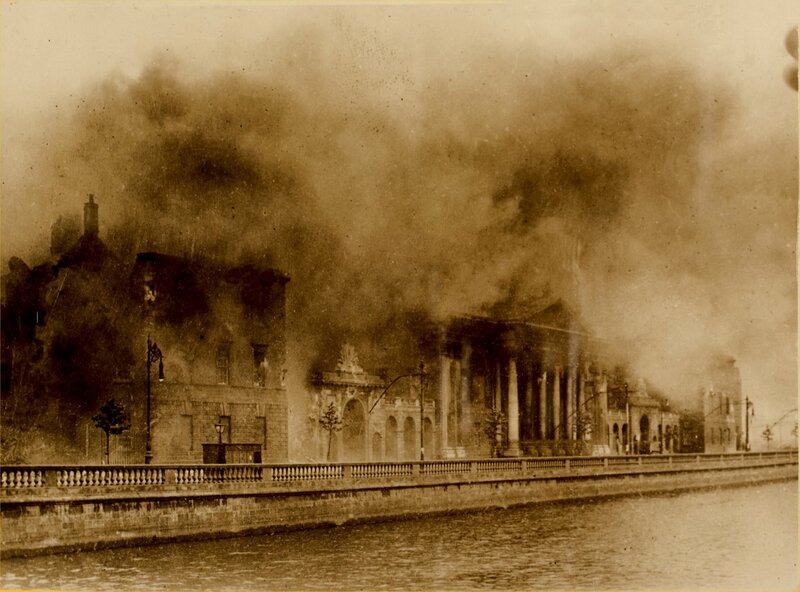 The Four Courts on fire in Dublin during the Battle of Dublin. Church of Ireland: One half of all the C of I registers were destroy in the fire in the Public Record Office of Ireland in 1922. But many of the local parishes had copies. The records were deposited in the Representative Church Body Library by December 2000 and are available for viewing in the library located at Braemor Park Rathgar, Dublin 14. The books lists the registers available by parish and dates. If you want to know about a specific parish, post your request to the list, and I'll post the dates and registers available (don't forget the county). Presbyterian: The Public Record Office of North Ireland has the largest single collection. They are on microfilm and are continually being update. I also have a list by county and parish and can tell you the dates and types of records available and the PRONI film number. Send your request to the list. However, many are still in local custody and I have a list of the parish and the year of when the records start.